Whenever I hear of a discovery in the world of Science, I also look for a parallel to that discovery in our world of faith. As we excitedly greet the news of the "proven" existence of the "God Particle", so too allow me to share with you the notion of the "Mustard Seed"; since it too is a tiny particle and yet sufficient for great and wonderful wisdom. Such was their lack of faith in his own home town, Jesus was unable to do any work of power there. We are told in today’s Gospel that he marveled at their want of faith. Likewise, this is all that it takes to bind ourselves to God and to one another; the tiny mustard seed, several millimeters in size. 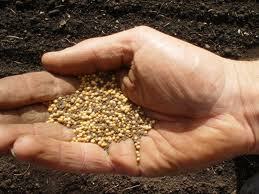 But still the God Particle is tinier by far than this very mustard seed. 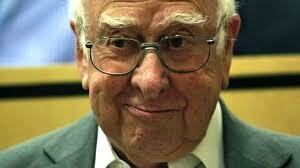 Scientists tell us that they can now establish the existence of what we call the “Higgs boson” named so for Peter Higgs who postulated its existence in 1964. Now that we have built the 17 mile large Haldron Collider near Geneva Switzerland, we can fire neutrons at one another at such unimaginably enormous speeds that when they collide we can actually “see” the evidence of this “invisible” particle. While we cannot see the particle itself, we can see the print it leaves in the universe much as we can see the print of a Snow Leopard as it travels though a winter scene. Therefore we can now postulate the existence of what Scientists call “The God Particle”, or that something that holds the universe together, the “glue” that gives to all matter its shape and mass. It is an extraordinary discovery and the world of Science hails its discovery and also hails Peter Higgs for understanding the necessity of postulating its existence. 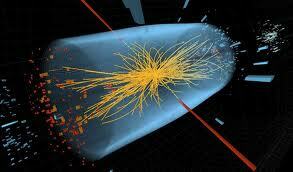 "A Higgs bosun went into a church and the priest said; “What are you doing here? You cannot have mass without me." It will be a matter of enormous interest to see where this wonderful new discovery will lead, at least for those of us who love science. During these past few weeks I have discovered and discovered again just how real this notion is for me. There is something that holds me together in this crazy quilt called life. Such was the outpouring of love and affection for me and my family from this congregation for the 40th Anniversary of my ordination, that my heart was filled with the kind of gratitude that words are, by necessity unable to express. And so, from the bottom of my heart thank you for that wonderful party just two weeks ago! And then there was the tragic circumstance of the death of Cindy’s brother. There was such a despair in that young man, such a sadness, such a rage that this terrible deed seemed the only way out to him. How tragic. How very very sad. And yet even there, I found myself bound together by the love of God and by the prayers of the church. Cindy’s family also found their way through the experience by expressing their bewilderment and then coming to terms with reality as best they could. And the love of that family bound itself together as we discovered the power of the love of God together. We did turn to God then. Where else is there to turn? It is interesting that even when so many in the so called Modern Age turn away from religion, still we cling to God in moments like this. The call to repentance takes on a special urgency for us when the simple affirmation of life becomes the core out of which we continue to live and move and have our being. We are told in today’s First Lesson that all of Israel had turned its back on God, rebels that they were. So too this age may often appear increasingly rebellious. But something is out there, or shall I say “In here” that calls us again and again to return to The God Particle within. That something that holds us together in times like this. 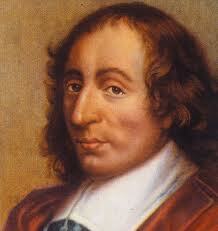 Blaise Pascal, one of my favorite theologians (1623-1662) and also a brilliant mathematician observed that we are suspended between the two infinities; the infinitely large and the infinitely small. And yet, like the God Particle itself, we will not see God by looking through our telescopes at the farthest expanse of inter-stellar space, nor will we detect God by peering into our finest electron microscopes. The collisions in the Haldron Collider the wreckage of life itself will provide us with the evidence of the footprints of God. Indeed, it will only be when we look within our hearts that we will see the footprints of God walking in our winter or summer landscapes. It won’t be easy. Like Paul noted in today’s Epistle, God gives us a “thorn in the flesh” to help us understand that it is in human weakness that we will discover God’s amazing power to save. No, this business of love, forgiveness, and reconciliation are every bit as hard as manual labor. Yet, the Surprise of Grace is that it is as light as a Breath from God. This is what continues to bring me back to God; to the love of God and the love of God’s people. This is what binds us together and gives our faith community shape. How I wish I could be at General Convention of the Episcopal Church this year. I’ve been to two of them. What fabulous parties they are. Wonderful worship. Fascinating discoveries of the crazy quilt that is the Episcopal Church...talk about “crazy quilts!” The great debates over the issues that concern us all, and then the discovery that God indeed embraces all of us in every widening circles of inclusion. Yes I’d like to be there, but then there is this “God Particle”. It is the building block of the Universe, apparently. Mind you, Science being Science, there is much much more to be discovered. But the God Particle of which I speak is that “Mustard Seed” within. My grandmother was a tiny woman. But her love for her family was so enormous that when she issued an invitation to Thanksgiving dinner, it was as if the Queen of England spoke and issued a summons to her Table. Dutifully we gathered, many complaining all the way, as the uncles from Springfield did. They had to go all the way to Boston! This was before the Mass Pike. But she was the glue that held us all together and gave our family shape. She was our God Particle! Eventually I found my way to Cindy’s family where the glue was there again. Now you and I are God Particles, my friends. Don’t miss it! Within you there exists the essence of God. So beautifully written and inciteful. You have patched a quilt together and bound us together as whole cloth. Love you, Fr. Paul. You are a blessing. Thanks for the kind words Chuck. These past few weeks have been harrowing for Cindy, Cindy's family and for me. Yet there is no doubt whatsoever that God's Particle within keeps us together and binds us together. AND you too are a blessing. I follow your teachings faithfully.